The heavier the pineapple, the riper it most likely is, so pick up the pineapple and feel it’s weight. A pineapple is heavier when there is more juice in the pineapple, which also makes it sweeter. You can gently squeeze the sides to check for ripeness as well. 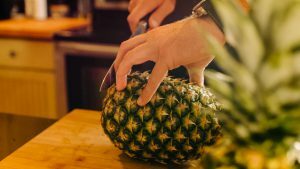 The pineapple should feel firm, but with a slight softness on the outsides when pressure is applied. Myth: Larger pineapples are not more ripe than smaller ones if they weigh the same amount. Fact: Just because a pineapple is bigger, it may not mean that it’s ripe. if it doesn’t feel heavy in weight, it is most likely not any riper than a smaller one that weighs the same. When ripe, pineapples should give off a sweeter scent near the stem. If the pineapple has no scent, that probably means it isn’t ripe yet. If it gives off a smell of vinegar or alcohol, that could mean it’s too ripe and is starting to rot. Myth: Pineapples have to be yellow all around for them to be ripe. Fact: Once a pineapple is plucked from the tree, it cannot ripen any more. Pineapples are picked as soon as they are ripe and often have more of a green resemblance, so letting it sit out won’t change the color. Green pineapples can still be ripe. The leaves on top of the pineapple can say a lot about its health. If the leaves are brown, yellow, or anything other than green, it probably means that it’s not a healthy and ripe pineapple. You can also try to pluck a leaf off of the pineapple and if it comes off with ease, it is ripe. Myth: Pineapples are only good for a few days. Fact: Pineapples can be stored in the refrigerator and kept fresh for up to two whole weeks before cutting. After cutting the pineapple, it can be stored and kept fresh for up to one week. This entry was posted in Featured, Latest News, Tips & Tall Tales and tagged pineapple, pineapple myths, pineapple tips, ripe pineapple. Bookmark the permalink.